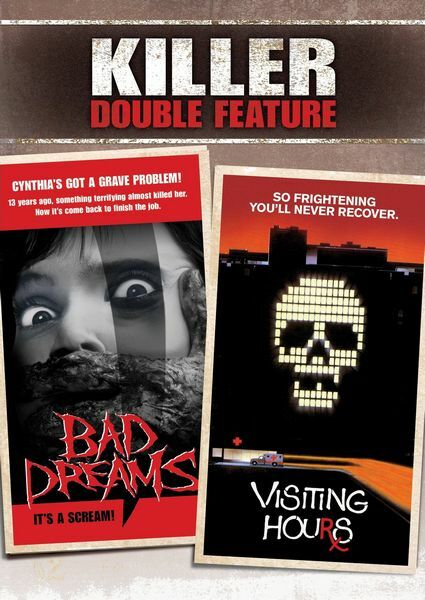 Schlock-Wire: Shout Factory To Reissue 80’s Hospital Horrors BAD DREAMS And VISITING HOURS In September – Schlockmania! In the mid-1970s the members of the love cult Unity Fields sought “the ultimate joining” by dousing themselves with gasoline and committing mass suicide. A young girl blown clear of the fiery explosion was the only survivor. Thirteen years later, Cynthia (Jennifer Rubin, Screamers) awakens from a coma inside a psychiatric hospital with only buried memories of that horrific day — but now her fellow patients are each being driven to their own violent suicides. Has the sect’s leader (Richard Lynch, Deathsport) returned to claim his final child? Bruce Abbott (Re-Animator) co-stars in the intense shocker Bad Dreams from director Andrew Fleming (The Craft) and producer Gale Anne Hurd (Punisher: War Zone, The Incredible Hulk). Feature Running Time: +/- 80 min. Presented in association with American Entertainment Partners II L.P.
Academy Award®–winner Lee Grant (Best Supporting Actress in 1975 for Shampoo) stars as outspoken TV journalist Deborah Ballin, whose crusade against domestic violence enrages a creepy loner (a truly disturbing performance by Michael Ironside, Scanners) in Visiting Hours. He brutally attacks the anchorwoman in her home, but Ballin survives and is hospitalized. Her assailant is enraged; he is haunted by a horrific childhood trauma . . . and now he has hidden himself inside the hospital to finish what he started. Can anybody — including her concerned boss (William Shatner), a frantic nurse (Linda Purl, Happy Days) or Deborah herself — stop the psycho’s killing spree before it reaches sick new extremes? In the mid-1970s the members of the love cult Unity Fields sought “the ultimate joining” by dousing themselves with gasoline and committing mass suicide. A young girl blown clear of the fiery explosion was the only survivor. Thirteen years later, Cynthia (Jennifer Rubin, Screamers) awakens from a coma inside a psychiatric hospital with only buried memories of that horrific day — but now her fellow patients are each being driven to their own violent suicides. Has the sect’s leader (Richard Lynch, Deathsport) returned to claim his final child? Bruce Abbott (Re-Animator) co-stars in the intense shocker Bad Dreams from director Andrew Fleming (The Craft) and producer Gale Anne Hurd (Punisher: War Zone, The Incredible Hulk).Academy Award®–winner Lee Grant (Best Supporting Actress in 1975 for Shampoo) stars as outspoken TV journalist Deborah Ballin, whose crusade against domestic violence enrages a creepy loner (a truly disturbing performance by Michael Ironside, Scanners) in Visiting Hours. He brutally attacks the anchorwoman in her home, but Ballin survives and is hospitalized. Her assailant is enraged; he is haunted by a horrific childhood trauma . . . and now he has hidden himself inside the hospital to finish what he started. Can anybody — including her concerned boss (William Shatner), a frantic nurse (Linda Purl, Happy Days) or Deborah herself — stop the psycho’s killing spree before it reaches sick new extremes?